« A view from the pedestal or from the depths? This morning, an insistent yearning compelled me to go outside to my garden. I knew I was weary and seeking sustenance. I pulled away some of the murky, composted leaves to better see bright green shoots just beginning to poke their heads out of the muck. 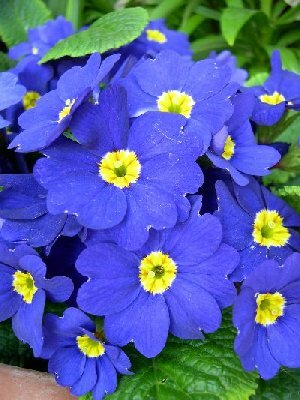 In an isolated corner of the front yard, a solitary primrose offered its bouquet of blue flowers as invitation. Why tears began to come, I’m not sure. Sometimes a sense of hope in the midst of challenging times can be both consoling and a release of the tension you recognize you have been holding. Doing anti-racist work is difficult. I glanced at dead stalks still clinging to a unsteady, upright stance as if to remind me, “There’s life underneath.” I put on my gardening gloves, got my clippers, and began late season pruning to ensure light could better get to the “underneath” preparing to come forth. It felt good and I confidently moved to the back yard where I would do more clearing. That was where I met the ivy. I was shocked that the few tendrils occasionally showing up in the yard had, over this wet and warm winter, joined forces to become thick branches with multiple vines curling around each other, the chain link fence, and my other plants. I was furious at this invasion and the threat it was posing for my garden. I began hacking and pulling, trying to get the roots out of the ground. They seemed to simply lead to other places where the vines had taken root and were growing new plants. I thought about racism. It was difficult to know where to put my energies. Following the vines that were rooting in new places and pulling them out seemed important to stop new growth. It also felt satisfying to just take my clippers and clip, clip, at the various branches. Yet, I knew that the to really make an impact I had to pull out the thickly gnarled trunks from which the vines were originating. Some were so big or interwoven with the fence or other plants that I couldn’t get my hands fully around them. A few seem to be in my neighbor’s yard, which I noticed created some resentment in me. I wondered, did they start in my yard and go to theirs or vice-versa? I recognized it didn’t really matter. If we didn’t work together to get the ivy out of there, the plants we both were growing would be smothered. I worked on one “grove” (I couldn’t get it all out), then I looked for others in the yard and pulled and clipped at them. I had to go under the lilac tree whose branches kept hitting at me even as I was trying to pull out the ivy winding around its trunk. As I worked by the roses, the thorny branches caught on my vest. As I pushed them away in frustration, my hand got scratched. I determinedly focused on my work despite the unexpected things flailing in my path. Finally, my energy spent, I stopped for today. I recognized I would need to keep coming back; the roots weren’t fully removed. I have to be constantly vigilant. As I went toward the shed to put away my tools, a whiff of something springlike came to me. I turned and saw the winter honeysuckle with its small yellow and white blossoms confidently releasing their fragrance into the winter air. I noticed the abundant buds on the camellia bush soon to burst into bloom. It fed something deep inside of me. Perhaps sustenance for the journey is recognition of the ongoing cycles of despair and regeneration; to learn, from the earth, how engagement with all of it is needed if we are to persist in the pursuit of justice. I say this fully cognizant that I have the privilege that allows me to experience changes in those cycles in ways that simply do not exist for some others for whom daily despair is the consistent cycle. Therein lies the call for me to respond so as not to dishonor those who have gone before me doing this work. Listen to Holly Near sing about this. I am willing was written after 9-11 and it has something to say about working for change.